Thank you for joining us on our journey during Early Access. We’re excited so many of you are here and we’ve enjoyed seeing all of the incredible forts, amusing gifs, helpful videos, and the fantastic feedback you’ve sent us so far. During Early Access launch we’ve identified a number of bugs that are important for us to address as soon as possible, so our first update focuses on a number of those fixes. 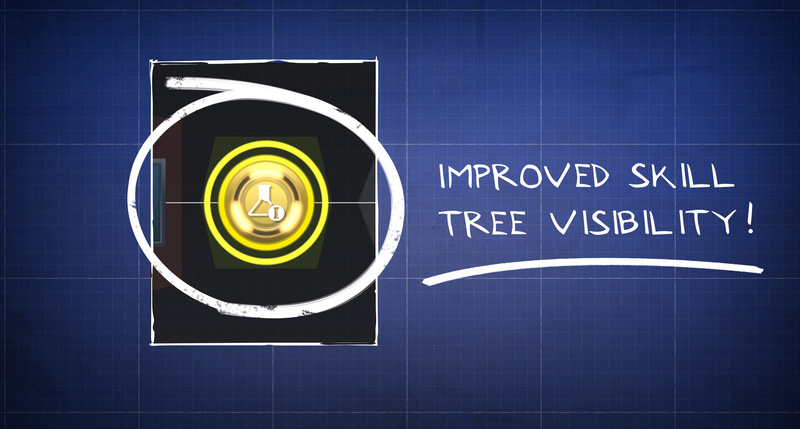 We also snuck in a handful of quality-of-life improvements based on things we’re hearing from you. This update will roll out on 8/4 at 4:00 a.m. EDT. It will require some downtime, but we’ll get you back in crushing Husks ASAP. 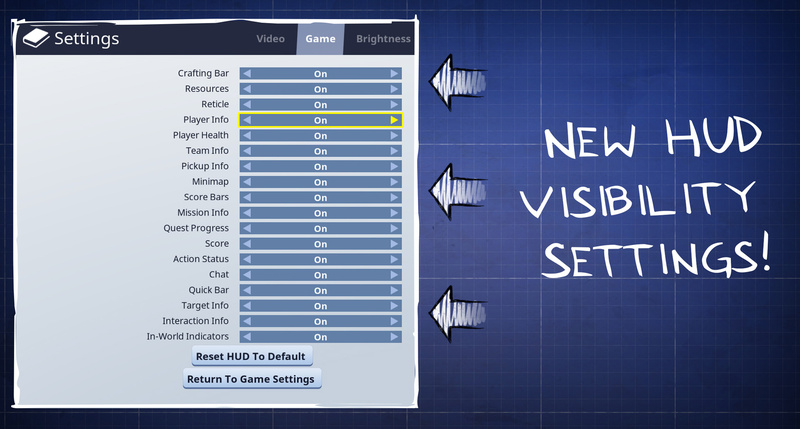 Added options in the Settings menu to turn off specific HUD elements. Items are no longer marked by default for recycle when entering recycle mode, making it more difficult to unintentionally recycle the wrong item. 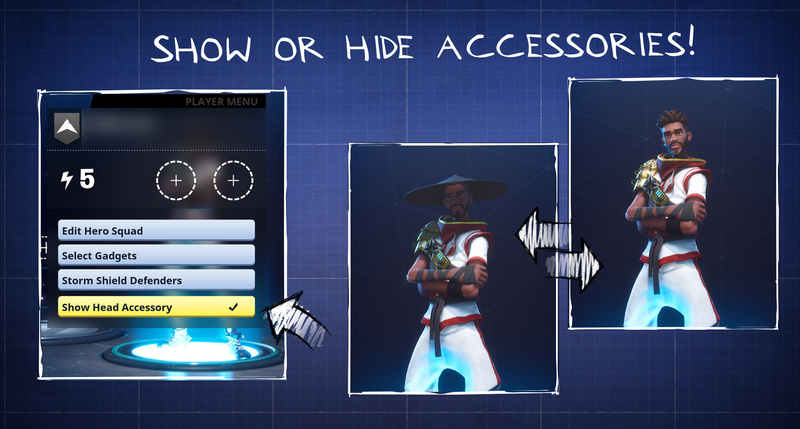 Added an option to toggle visibility of hats and backpacks on Heroes. Updated visuals in the Skill Tree to make it more obvious which node is currently selected. 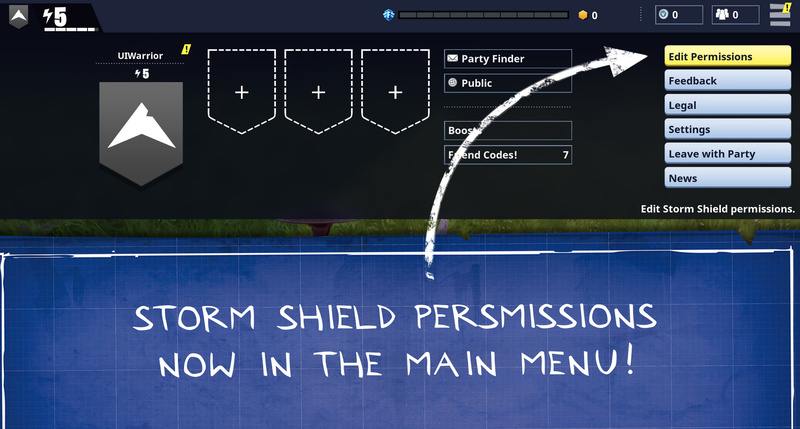 Added an option in the main menu to set Storm Shield building permissions for party members. No more running to your Storm Shield in the middle of battle. Added a notification for players who load into another player’s Storm Shield mission if they attempt to do something they do not have permission to do. Ammo crafting page in the inventory now shows weapons the player currently has equipped. This permits seeing their ammo counts during crafting. Ninja and Outlander quests are now displayed in the campaign map. Fixed some mini-map icons on weapons that would look like boxes when dropped in the world. Fix a hang that would occur when dropping some weapons. Fixed a bug that caused the Homebase Banner Icons to appear stretched on the end of mission banners. Fixed collision with the rocks in the Canny Valley Storm Shield. Clouds will now dissipate after firing the Atlas in Fight the Storm missions. Fixed a bug where the teleporter FX will scale to an enormous size if placed on a slope. Fixed an issue where certain cinematics would not play on PS4. Music stinger now plays when Husks are woken up. Pitcher Husk wind-up and throw is more noticeable. Phase Shift will no longer kill an Outlander if used over a Teleporter gadget. Enemies now correctly detach from the Bull Rush shield when colliding with other surfaces. Item stacks that aren't at max limit will now auto-stack. Fixed some issues on PC that occurred while alt+tabbing in windowed mode. Fixed a rare issue where players wouldn’t respawn. Fixed an issue where Defenders weren’t able to fire charging weapons. Fixed an issue with the Soldier’s death animation which failed to play during the Shockwave ability animation. Fixed an issue with damage numbers which would occasionally cause the number "0002" to appear. Fixed an issue where players that joined wouldn't see the correct BluGlo count. Improved Defender spawning and teleporting to prevent Defenders from not spawning on the Defender Pad. Fixed an issue where after moving a Defender, the player would lose the gun and ammo that the Defender had equipped. Fixed an issue with schematic crafting progress. Fixed several enemy collision issues. Fixed an issue where loot containers in Storm Shields would often appear as the default orange box mesh. Fixed an issue where Husks would be able to damage the player from a great distance away. Fixed an issue where Husks would move and float in the air. Fixed an issue where the first objective was not started before the player reached the lab, causing objectives to not be completed. Fixed an item stacking problem that could result in quest rewards going to Storm Shield Storage despite available inventory space. Fixed various crashes which could occur when starting a mission. Fixed an issue where players could cause damage and destroy Lars’ van during Ride the Lightning. Fixed an issue causing players to be unable to claim Expeditions. Fixed an issue where players wouldn’t receive the right tier of weapon from an Expedition. Fixed an issue where players became blocked during the first “Ride the Lighting” mission. Fixed an issue where rescuing survivors wasn’t giving quest progress. More descriptive information will now be displayed for skill tree nodes that modify player attributes. Weapons and traps now rotate on the inspect screen. Fixed an issue that would only allow the far-left loot card choice to be selected. Llama loot cards no longer show total amount of resources, to avoid confusion about how much the user got. Fixed an issue where a Defender's main and stats panel tab didn’t display information in the armory. The drop item window will no longer appear while trying to drop an item as the rewards flow begins. The item management Level Up filter now limits the view to items the player has enough XP to upgrade. Fixed issues with text being cut off in the collection book. Fixed an issue that prevented claiming quest rewards that were completed during the tutorial. Fixed for client crash after signing out of PSN or Xbox Live during the Loot Llama Quest. Hid the "Leave Party" button from party management menu when in zone. This prevents the player from leaving the party and the zone without going through the proper warnings. Fixed some text that wasn’t localized in error messages. Fixed some issues where players were prevented from completing the tutorial if they logged out of the game during the tutorial. Rapidly claiming expedition rewards should no longer cause an error. Fixed the issue where the inventory screen stays up when pressing Alt+Tab. Fixed party invitations occasionally not appearing when a friend re-invites you. Fixed an issue where the player would lose functionality in the collection book rewards screen. Fixed a rare audio crash on Xbox One.